I'm having a hard time understanding why pitch doesn't change as a plucked string slows down. Doesn't the frequency slow down? If frequency is directly related to the sound that the ear hears, won't that alter the pitch? Does it happen too quickly for our ears to register? Fun test to try ! But for a french guy, the science video was brutal ! I got most of the stuff though, good thing that I learned it in school . Maybe some of you can enlighten me on one point. It seems like I hear lower frequencies on my headphones than on my monitors. I don't have any foam under my monitors so I thought the lower frequencies would be louder since they would make my desk vibrate. Is it correct ? The pitch does change if the string slows down, but that's not what's happening when a plucked string loses energy. It's not slowing down. It keeps moving back and forth at the same rate, but less vigorously. The energy of the vibration is being "spent" to move the air around it, and there is some to friction at the ends of the string. That loss of energy in the string doesn't slow the string down, though, it only makes the string quieter. A "slower" string will sound deeper, but only a change in the properties of the string will make it vibrate slower, for example tension of the string, the length of the string, etc. When talking about the wave motion of the string, frequency is the pitch, which can be changed by increasing the tension in the string (tuning) or changing the length of the string (fretting up the neck). The loudness of the string is the amplitude of the wave, and will naturally decay as the string loses energy. If you want to read in more depth, there's a really good basic explanation of the physics at physicsclassroom.com in the physics tutorials. Hope I helped! I'm not an expert on this, but I think the main difference is the volume of air that the headphones have to move compared to the monitors. It is likely that your monitors are capable of reproducing the sound, but that you would only hear it if you strapped them to your head like they were headphones! Naturally the monitors are capable of being much much louder than headphones, which means more amplitude and more energy. Pushing that much air accurately and without distortion, while also not losing the quieter sounds, is what makes bigger nice speakers cost way more than nice headphones. I just thought of this... you didn't mention if they were earbuds or over the ear headphones or something else, but with earbuds and sealed cup over the ear headphones, the air inside your ear can be pressurized by the sound, which will enhance the bass. Try holding the cups or the buds just outside where they normally sit and the sound changes very much. The test gives me a response from 20Hz to 8kHz. Is there a task for module 1? The older you get, the less you'll hear the higher frequencies. @stepanpruch That's a very interesting point you bring up. I did a great deal of frequency analysis in my graduate study of musicology, and had many of the same questions you do when I started and I can't say all of them have been answered definitively. The plucked string is a very complicated thing to understand -- as it moves side to side, the string stretches and one might think that would cause a drop in pitch due to it getting longer as it moves off-center. But there's another parameter to consider, which is that as it stretches out, it gets both longer and tighter. The tension of the string counteracts the lengthening, and so it doesn't so much "slow down" as it does "relax". There are subtle drop-offs in pitch with many plucked strings as the sound decays, you can hear it and see it in frequency analysis -- but it's usually in small amounts and easily missed, sometimes due to poor quality instruments or strings, or technical issues such as performer technique or extraneous movements. The point is, the really interesting thing about musical strings is that they can vibrate at the same speed (hertz, or cycles per second) producing the same pitches no matter whether it's loud or soft. When a good string on a good instrument is plucked by a good player, it can speak the same notes (meaning it vibrates and excites the air at the same speeds) in a practically infinite variety of volumes, intensities, timbres, textures, etc. Some smarter people than me will probably discuss this further, but it's a very interesting discussion. But yes, as you've discovered, pitch isn't as cut and dry as it may seem. Often, especially with the example of a plucked string, and especially during the attack (the first few milliseconds of a sound) the pitch is often skewed considerably, or very indefinite. But we just don't notice because it happens so quickly, or we consider it to be "part of the sound". By the time it's settled into casually ringing out we tend to focus on the nice consistency of a musical vibration, and we consider the blast of frequency clusters that happened at the beginning of the sound to be like a cleansing of the palate, clearing the way for the uniform vibration to start anew. Vi, the lady that made youtube clip tweeted this to me. I felt that her answer was missing something. Thanks for clarifying. But maybe I could hear it if I had better hardware. How can I tell? After 100 Hz I had to put the volume down on the evaluation of the frequency range. The science and math video was pretty amazing, I play violin and all of this was kind of new to me, even thou on school I was taught a little bit about this. The explanation is very practictal. I cant wait to try it out with the program. Thank you! I have the same prob,em with missing bass response on speakers vs headphones. I, personally, didn't do the test with headphones and I won't. It gave me a headache. My father, sometimes, used to call me hound dog ears; because, I can just hear everything:) Your range probably would broaden somewhat with audiophile quality equipment. I can tell a difference when I listen thru my stereo amp and good headphones to music at normal levels. I don't have enough gear to go with my laptop to really advise. I'm trying to figure out what to buy myself. Your range is your range. Basically, you are going to have to work within it and use the graphs in the software in a relative way. A 10 year old laptop may be an issue, in that, the processor is small to run these software programs. Probably, a 4 and 8 ram is the minimum for this kind of stuff. I'll try to help I'm really just a singer and dancer so this is not my area. 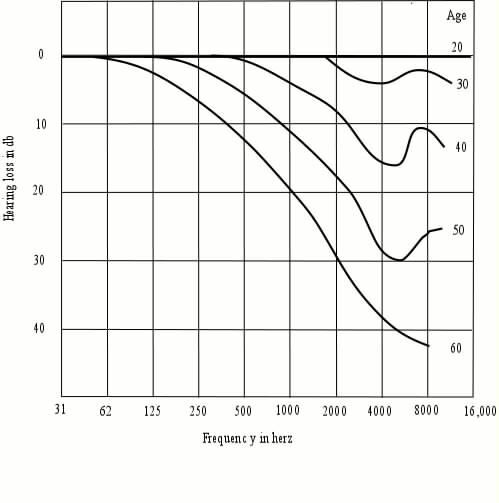 It's probably not that your headphones have a wider range, but that they have a spike at low frequencies. Many consumer grade speakers and headphones boost lows and highs in the 'DJ Smiley Face' EQ pattern. It's a good thing to know you're listening to a mix, and the fact that you're aware of the differences in your equipment is great. It is always a good idea to listen through various speakers to and try to tailor your mix to as many as possible (or whichever you think your target audience will be using). Not knowing your exact setup, for the purpose of this course, I'd direct you toward trusting your studio monitors as being a more neutral or 'accurate' representation of the mix. I would hate to be the bearer of bad news, sir, but nearly all functioning sound cards and headphones are capable of producing frequencies greater than 8k. At age 65, you have developed in many ways that a younger man has not. Unfortunately, your hearing is not one of those developments. This doesn't mean you should give up! It certainly helps to be aware that your hearing rolls off at higher frequencies. You should trust your equipment and use an EQ or spectrum analyzer to visually see what the upper range of your mixes sound like. Have a friend give feedback if you are unsure, and adjust based on their suggestions, referring back to your visual aids, and soon you will gain confidence in your mixes. Al, don't worry about it. There are people with record deals that have hearing so relative it's a joke on consumers. Myself, I am the lead singer and producer of a working cover band and the only girl. I do the hiring. This is especially true of lead guitar players they have dexterity for the playing; but their hearing is so relative in pitch and so forth that no legitimate singer would ever be able to hire them. And, they just go all egomaniac and just bonkers arguing points with you that they can't even hear correctly. That's why so many of the harder rock bands with shredding lead guitars have the more monotonous singers. Guitar players are all deaf. That's the main reason they can't hear and most of them never really learned music. They just learned to play music if that makes any sense.